An Albatross floats peacefully on the surface of the water near Kaikoura on the East Coast of the South Island of New Zealand. 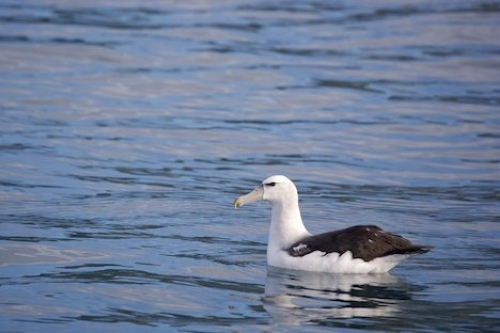 While on a dolphin watching tour with Encounter Kaikoura in the waters off Kaikoura on the East Coast of the South Island of New Zealand you will see a variety of different seabirds such as the Albatross. This Albatross sits quietly on the water as our boat passes by in search of dolphins. The Albatross spends a considerable amount of time at sea and there are approximately twenty different species of the Albatross that have been recognized. Twelve different species breed on the islands around New Zealand and seven of these types do not breed anywhere else but in the New Zealand region. An Albatross can live its whole life at sea where it feeds and sleeps but they do not nest or breed at sea. They must return to land where they nest in colonies. The Albatross has a tube shaped nose that it uses to eat and drink the salty sea water which we as humans could not drink. They use their tube noses to get rid of the salt as it drips off their beaks. This spectacular seabird is one of the largest flight birds around the world and many of them travel hundred of miles to reach Kaikoura. On some of the Albatross around New Zealand, you may notice a band around their legs which have been put on by researchers when the Albatross are situated at their nesting grounds. When you tour with Encounter Kaikoura off the South Island of New Zealand, you will be sure to encounter an Albatross along with many other species of seabirds and dolphins. Albatross during a dolphin watching tour with Encounter Kaikoura, Kaikoura, East Coast, South Island, New Zealand.